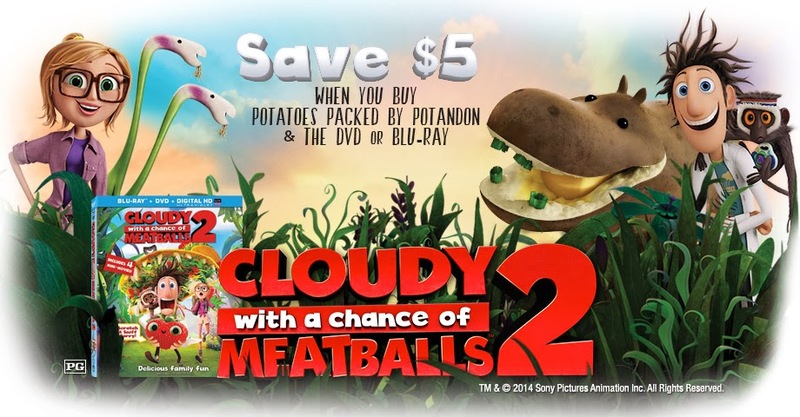 $5 Instant Savings Coupon for Cloudy With a Chance of Meatballs 2 DVD + Blu Ray Combo! Klondike Brands and Sony Pictures are teaming up to offer consumers big savings! Beginning January 28th, get $5 off your purchase of Cloudy with a Chance of Meatballs 2 Blu-Ray + DVD combo when purchased along with Green Giant Fresh, Klondike Brands or Sunfresh potatoes. Look for this instant coupon on these bags of potatoes in your store. Previous post$1 Snack Size Popcorn Chicken Today (1/21) @ Sonic. Next postLogan’s Roadhouse ~ B1G1 FREE Entree Feb. 2nd!